Taking the Train from Amsterdam to London - What Are Your Options? 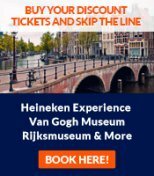 Train from Amsterdam to London - What Are Your Options? Sick of endless security lines and infuriating rules at the airport? Taking the train from Amsterdam to London could be the solution to your troubles and make for a pleasant journey along the way. This page has the details, including alternatives to train travel. Eurostar with the Intercity or Thalys? If you wish to travel solely by train, then you should change trains in Brussels as there's no direct train from Amsterdam to London. The only operator on the Brussels-London stretch is Eurostar, for which you can buy tickets at www.eurostar.com. For the Amsterdam-Brussels stretch, you can catch the intercity train departing from Amsterdam Centraal. There is no need to book in advance and you can buy this ticket at Amsterdam Centraal minutes before departure, from the regular ticket machines or the domestic ticket office. The Intercity service travels 9 times a day from Amsterdam to Brussels on weekdays, with reduced service on weekends. The trip takes roughly 2 hours 45 minutes to get from Amsterdam to Brussels and the Eurostar train will get you from Brussels to London in just over an hour. You can also book the whole Amsterdam-London trip with NS (Dutch Railways), via their website at www.nshispeed.nl, by calling 0900-9296 or in person at the international ticket office at Amsterdam Centraal Station (which often has long waiting lines). A combined Eurostar-Intercity ticket can also be bought which covers your journey on the Intercity train to Brussels within 24 hours of your Eurostar trip. These may actually work out more expensive than buying the tickets separately however, so check both options before catching the train from Amsterdam to London. 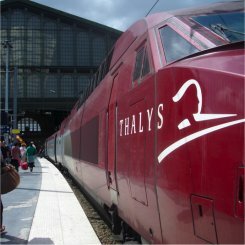 The last option if travelling with Eurostar is to combine the trip with the high speed Thalys train between Brussels and Amsterdam. 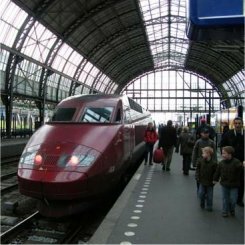 Thalys is faster than the Intercity option, taking 1 hour 55 minutes approximately, and more luxurious but runs less frequently, 6 times a day, and requires advance booking. It goes without saying that the Thalys option is also more expensive. Here's more information about international train travel from/to Amsterdam. If you are not set on traveling solely by train from Amsterdam to London, then a nice option can be to combine the train with a ferry trip from Hoek van Holland. In this case you can catch the Intercity train from Amsterdam to Rotterdam and then hop on the local Sprinter from Rotterdam to Hoek van Holland. From here you have the choice of either the day or night boats with Stenaline to Harwich in England and then the train from Harwich to London. This obviously takers longer than the Eurostar option, but can be a nice, relaxing way to travel and with a combined ticket can actually work out pretty cheap. Taking the night boat option also eliminates one night's accommodation costs, a nice trick for backpackers. You can book your tickets on the Stenaline website, www.stenaline.nl, from Hoek van Holland to London and then buy an Intercity ticket at Centraal Station on the day of travel from Amsterdam to Hoek van Holland. It is possible to book one ticket covering the entire journey on ferry and train from Amsterdam to London via the Stenaline website, but only on the Dutch version of the site - so either ask someone who reads Dutch to help you out or pay the slightly higher fare. Taking the train from Amsterdam to London is not the only way to travel. The most popular alternative is, of course, air travel. There are many airlines operating between these two large European travel hubs, and numerous flights each day. Prices and times vary considerably between airlines and the dates involved. Some popular operators on this route are British Airways, BMi, KLM, CityJet, Czech Airlines, Lufthansa and Aer Lingus. Flying can be faster than catching the train from Amsterdam to London, but also involves all the hassle of security that air travel incurs these days. Remember also to consider the amount of time you are required to show up at the airport before your flight when comparing the time taken to travel by air versus rail. Travelling by plane can also work out much more expensive depending on how far in advance you book your tickets. Also read our pages with airlines to check for cheap tickets from/to Amsterdam. The final public transport option is to take the bus service from Amsterdam to London Victoria Coach Station with Eurolines Coaches. This service travels three times a day and takes between 9 and a half to 11 hours, depending on time of day and traffic. Tickets can be booked at the Eurolines office in Amsterdam on Rokin, close to Dam Square. The Eurolines option is reasonably priced and the coaches are pretty comfortable, a good option for those with plenty of time who don't get travel sick on long journeys. For most, however, the train from Amsterdam to London may still be the best land-based option. This page has all the information about Amsterdam Centraal Station, the biggest Amsterdam train station. Most visitors who go to Amsterdam by plane or international train, will arrive here.